Today we apply the same methodology that we previously used to study the rise and fall of confidence in the American economy to the UK. The chart below is the historical plot of the ratio of the UK public debt (in pounds sterling) to the value of the UK Central Bank gold holdings (similarly in pounds). A low ratio generally suggests economic soundness, and the ratio tends to increase with increased debt load. The ratio can fall due to increased holdings of gold, but for the UK and the US since WWII, the ratio falls due to a rising price of gold. Gold reserve data to 1998 comes from the World Gold Council website (you need to create an account and sign in to download files). 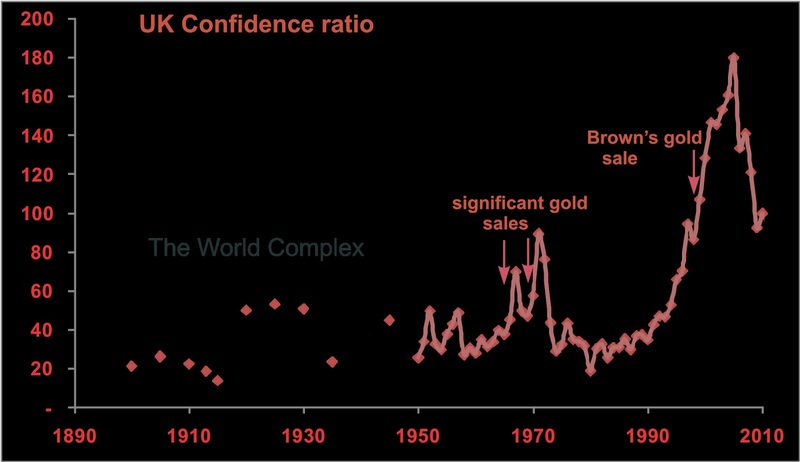 Information concerning the UK gold holdings is a little sparse before 1950, but it appears that the confidence ratio shot up during WWI, as public debt rose ten-fold and gold holdings tripled. Gold holdings increased through the 1930s, no doubt escaping the continent. The fluctuations in the 1950s were due to fluctuations in gold holdings, as were the spikes in the late 1960s and about 1970. By the mid-70s, debt was increasing rapidly, but was more than matched by the rising gold price, resulting in a fall in the confidence ratio. 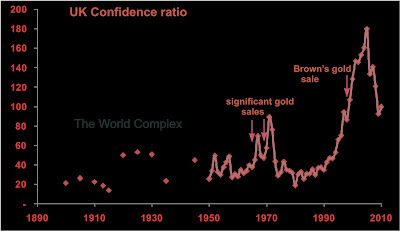 The famed Brown gold sales beginning in 1999 led to the last enormous spike (perhaps this should be the recklessness ratio instead of confidence ratio). This ratio peaked in 2005, and its subsequent decline is entirely due to the rising price of gold. In fact, the UK public debt has more than doubled since 2005. And even though the UK gold holdings have declined further since then (albeit by only about 0.5 tonnes), their value has more than tripled since then. Here, once again, is the graph of US confidence. If we consider gold to be a currency, then what we are looking at (for both the US and UK) is a situation where the government is inflating but the market is deflating. The number of dollars (or pounds) has increased, but the total purchasing power of all of these pounds or dollars (in terms of gold) has declined. The rate at which this is occurring is perhaps low enough we may call this inflationary deflation, but one wonders which line do we cross before we recognize this situation as hyperinflationary deflation. Of course the interesting question then becomes--can Helicopter Ben really print faster than the market can destroy? We may soon find out. Came over here from The Trader blog, glad I found you. However, I'm more confused now than after reading your guest post over there! I will read and re-read, but if you could write more on this it would be greatly appreciated, as understanding this seems very important. Poor Gordon Brown . . .
Are the Swiss joining the Weimar movement?